Today I'd like to share two "SWEET" cards by my blog readers. The first card was made by Snehal. 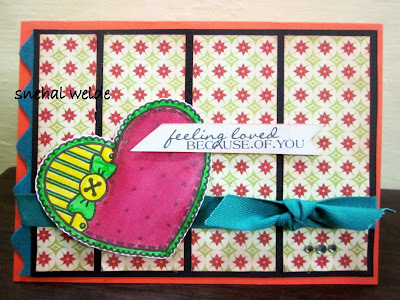 Snehal's Creations : I heart you! And the next one is from Shirl. Creations by Shirl : LOVE! You can find the images they used HERE.﻿ Enjoy! Gorgeous cards. Thanks for sharing the wonderful creations. They are both so fab, Torico! The first is so vibrant and the second so fresh and sweet!